As its name suggests, the rust remover is a special type of product that allows you to remove rust and other forms of corrosion on metal very easily. But one of the best things about this product is that most top-rated rust removers on the market requires no special equipment to handle and are non-toxic and safe to the skin. Additionally, you get a lot of bang for the buck with the rust remover because it is very affordable and you normally don’t need to use a lot of it which means that it will last you a long time. If you are looking for a rust remover, then our review below will guide you in the right direction. The Evapo-Rust is a popular rust remover that is can be used to remove rust and other forms of corrosion on metal. One of the main features of this rust remover is that you do not need any special equipment to apply it. Indeed, even if it comes in contact with your skin, it is perfectly safe. Additionally, this is one of the few rust removers that will not emit any bad odors and also contains additives that will protect the surface of your material from further corrosion. When applied on materials like plastic, it will not affect the surface of the material, and above all, it will also not discolor it. It can also safely be used on paint, no problem. 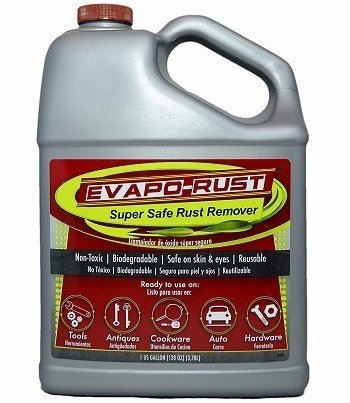 All in all, when it comes to safety, the Evapo-Rust is the best rust remover for the money. We highly recommend it, especially if you have pets and children around. One of the main distinctive features of the Turtle Wax is that it contains additives that not only removes rust from the surface of materials, but it also polishes. Indeed, this rust remover will leave your material surface with a clean and shiny finish. It does so by sticking on the surface of the material and reflecting light in such a way that it makes it shine under a light source. Also, this product will prevent any future oxidation of the surface that it protects. Note that the Turtle Wax is mostly effective on surfaces like chrome. It is not specifically made to remove rust (iron oxide) or corrosion on metals like iron. 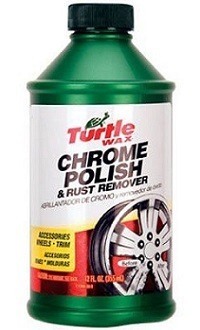 Moreover, it is also the most affordable product in this rust remover review so if the price is the main concern to yo; then the Turtle Wax is an excellent choice. One big problem that most rust removers on the market phase are scrubbing. After you have applied the rust removal solution, you will need to scrub so as to remove the rust from the material surface. This is not a problem with the Workshop Hero because there is simply no scrubbing necessary. It will automatically remove any rust, even if it is a thick layer of iron oxide. In addition, this rust remover is available in different sizes, from 32 oz for smalltime usage up to 5 gallons for those who need to remove rust on a large surface area. Also, this rust remover is perfectly safe as it is not acidic and does not cause any harm to the skin. 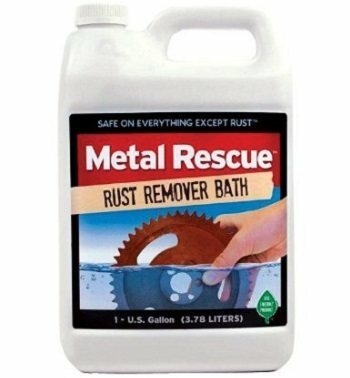 There is simply no equipment necessary to apply this rust remover. Therefore, the Workshop Hero is without a doubt one of the best rust removers for metal that you can currently buy. It is versatile, efficient, and safe to use. 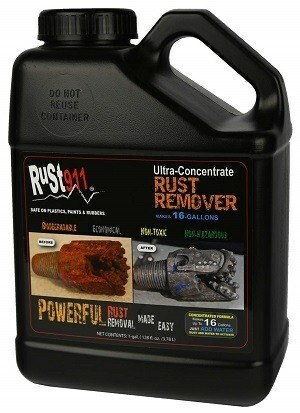 The action time of this rust remover will depend on the thickness of rust that you have to remove. This rust removal can take up to 24 hours for very thick rust layers. However, it usually takes around 5 to 15 minutes to remove small layers of rust on metal. If you don’t have to remove rust on a big surface, then the Whink is an excellent choice to consider. It is available in a 32 oz container, and the product itself is actually a wax rather than a liquid. In order to use it to remove the stain on the surface of materials, you will need to use a piece of dry cloth and perform a rubbing action to remove the rust. All this may sound like a lot of work. However, it is very easy to use and quite effective. Additionally, it does not affect the surface of the material and will provide a long-lasting protective effect. One other area where this rust remover is quite effective is in the automobile department. Indeed, if you have to remove small stains and rust on the surface of your car paint, then the Whink will prove to be quite effective. It is definitely one of the best automobile rust removers on the market, especially considering its very affordable price. If you are looking for a small general-purpose rust remover that can also remove stains, then this product by Boeshield is an excellent grab. It comes in a small 8 oz container, but if you don’t have a lot of rust or stain to remove, then it will be just fine. Moreover, you do not have to use a lot of this product for it to work effectively. This product is a spray on, and you simply remove the cap and spray it on the rust or stain that you want to remove. Best, it is effective on all metals and porcelain materials. It is also perfectly safe as well as biodegradable, so it is fully environmentally friendly. 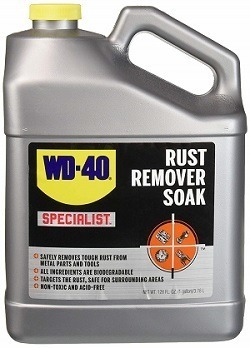 The WD-40 Specialist remains one of the most popular as well as the best rust remover on the market. This product uses an advanced formula and various additives that makes it very effective in removing rust as well as any type of stains on the surface of materials. It is fully biodegradable, so it is environmentally friendly. In addition, it does not use any acid or caustic chemicals to remove the rust, so it is perfectly safe to the hand. You do not need any special equipment to apply this rust removal. You can use this product to restore any type of metal surfaces, and once you have applied it, the surface will become brand-new again. Therefore, it is ideal for any general-purpose rust removal ranging from the home to automotive usage. 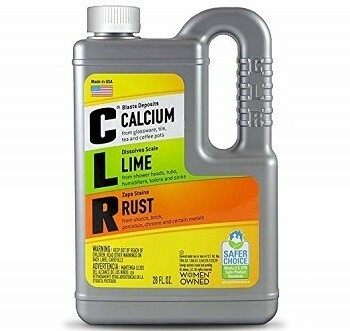 This CLR product is a very effective calcium lime formula that will not only remove stains and rust from metal, but it also contains additives that will help remove calcium as well as lime on any surface. You can use it to clean glass, porcelain, plastic or metal. It will not degrade the surface of the material or create a deposit. Moreover, one of the best things about this product is that you do not have to perform any scrubbing as it will automatically remove any stains and rust. This CLR product is a great general-purpose stain remover, and anyone who performs any type of cleaning should own it. All in all, due to its versatility, we nominate this product as one of the best rust removers for metal, as well as other types of materials like porcelain and plastic. Most of the rust removers on the market tend to be general purpose. That is, you can remove rust as well as another type of stains on almost any type of surfaces, ranging from porcelain, plastic, to metal. However, the Henkel Loctite is a special type of rust remover that has been designed exclusively to remove rust on the surface of the metal. One of the best things about this rust remover is that it is very fast action and will effectively remove rust within 15 minutes of application. This product is delivered in a 16 oz bottle, but if you need less and want to save some money, then you can also purchase this rust remover in an 8 oz bottle. Finally, since this product works mostly on metal, it is one of the best rust removers for a car that you can buy. Spray on rust removers are known for their ease of use. This current product is not another spray on stain remover. Indeed, it contains an advanced formula as well as many additives that will allow you to quickly and easily remove rust from any surface in a matter of minutes. This is a heavy-duty spray on rust remover that will not tarnish the surface of your material and can be used almost anywhere, from your kitchen to your bathroom. It does not have a bad odor, and one of its best features definitely remains that you do not need to scrub to remove rust or stain. It will automatically dissolve away any rust and stains. Taking all those factors into account, this product is most certainly the best spray on rust remover that you will find in this review. If you are looking for rust remover that is very easy-to-use as well as extremely effective in removing rust and stains, then this is an excellent choice. If the price is not an issue, then the Rust911 is a top-rated rust remover for the money. This is a different product from the other types of rust removers you have so far encountered in this review. This is because the Rust911 is an ultra-concentrated rust remover that uses an advanced formula so that it can eat away at any type of rust quickly and easily. You will need to add 1 gallon of water to 8 oz of concentrate, which makes it last even longer because you don’t need a lot to get an effective solution. Moreover, this product is fully biodegradable and safe, so you do not need any special equipment when applying it. But one of the best things about this rust remover is its shelf life. Indeed, it can be stored for up to 5 years as long as you close the container properly and do not mix it with any other solutions. If mixed, you can store it for up to 9 month which is still pretty impressive. Even if this rust remover is more expensive when compared to others, over time you will save a lot of money as it is more economical. This is because you only use 8 oz for every 1 gallon of water that you dilute it in. Rust is mostly iron oxide, and most rust removers contain additives and chemicals that will easily break down the rust. In fact, most top-rated rust removers can breakdown rust in a few hours, while others will need soaking for at least 24 hours before the rust can be removed. Furthermore, there is another type of rust which is in the form of corrosion. This is usually a mix of metal and metal oxides that have oxidized with oxygen. 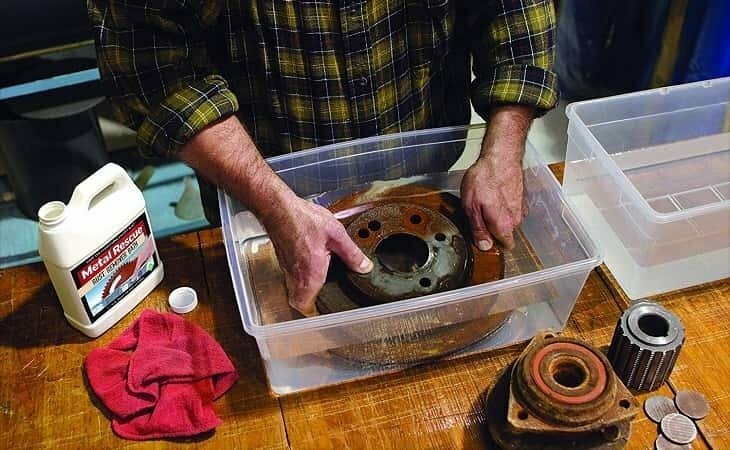 In addition, material that comes in contact with saltwater is also known to produce rust faster and should regularly be treated with a rust remover. There are several types of rust removers on the market that have different application procedures. For example, the spray rust remover is mostly for those who want to remove rust on a small surface area but in a hard to reach the place. Since the spray can reach long distances, it is suitable for this type of rust removal. The spray system is also one of the easiest rust removers to use. The only caveat is that the spray rust remover normally comes in a spray bottle that is less than 1 L in capacity. If you have a larger surface to remove rust from, you may consider the gallon rust remover. This type of rust remover usually comes in a gallon-size plastic container, and you need to apply the product with a paintbrush. At the end of the day, you will need to choose a rust remover based on your need and purpose. You don’t want to use a rust remover that is toxic and may affect your health. Furthermore, it is best to choose a rust remover that is chemically neutral when it comes in contact with your skin. It will be safer, especially if you have pets or children around. Also, you need to take into account the odor of the rust remover. Try to avoid rust removers that have a pungent smell because a bad smell does not dictate how effective the rust remover will be. One of the best things about the rust remover is its ease of use. You simply have to spray or soak the rust in the rust remover for it to start working. With most rust removers, you don’t even have to run for it to remove the stains or rust. It will automatically dissolve the rust for you. Neat! Furthermore, there are some rust removers that work instantly while others may require soaking for at least 24 hours. Before applying the rust remover, it is important to thoroughly clean the rusted surface. This will allow the rust remover to enter the pores of the metal oxides and have a more effective effect. Additionally, the versatility of the rust remover is important. One of the good things about the rust remover is that it also contains additives that allow it to remove regular stains from materials as well. Therefore, most rust removers can be used in every situation and place where rust and stains in general needs to be removed, from the kitchen sink to the bathroom floor. Rust removal is a universal task as a rust and corrosion can happen almost anywhere there is metal. With the rust remover, you can quickly and easily remove any rust without damaging the surface of your material. Furthermore, many rust removers come with additives and chemicals that will not only remove rust but also help protect the surface of your material from further corrosion. Our rust remover review above contains some affordable and quality rust removers. If you have not made your selection yet, read the review again as you may have missed something.